Long before I started trying to make furniture for myself I had a great admiration for Shaker furniture so it was natural that I should try to work in their style. I also made an effort to avoid slavishly copying any particular piece of furniture and preferred to go my own way, even to the point of never working from plans or pictures. In the case of this firewood box I made an exception to the old rule and tried, as closely as possible, to copy the look of an existing piece. On a visit to the preserved Shaker village at Pleasant Hill, Kentucky I had been taken by the appearance of a rough firewood box. Somehow I got the impression of an apprentice or new convert making it and rebelling, just a bit, against the norm and adding graceful but unnecessary curves to the box (and likely getting chewed out by an elder for the excess). Perhaps it was my own minor sense of rebellion that attracted me to the box. I photographed it in place and filed the picture away for future reference. Later I realized that the same box appears in The Book of Shaker Furniture by John Kassay and that the book also had sketches of it and dimensions. That pretty well decided the matter. The appearance, dimensions, and even the color of the box match very closely the original. The materials and joinery depart radically. There was obviously nothing wrong with the original nailed-together poplar that has already lasted about 150 years but that option didn't appeal to me. I had recently picked up a small quantity of yellow pine and didn't have enough of it for any major projects so it was a natural selection for this box. 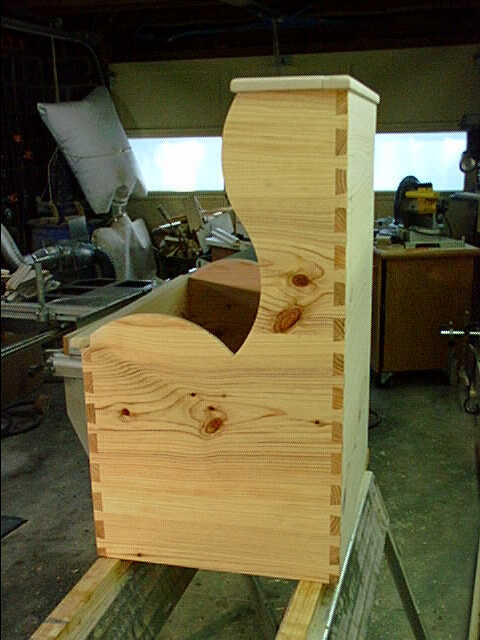 The joinery is the sort that might have been lavished on a good blanket chest. For those of you who have a near-fetish relationship with dovetail joints, here is a "bare nekkid" picture of the box nearing completion. I am fairly certain that the box will not be falling apart soon. Other joinery includes having the front and bottom of the kindling box float in blind dadoes in the sides. 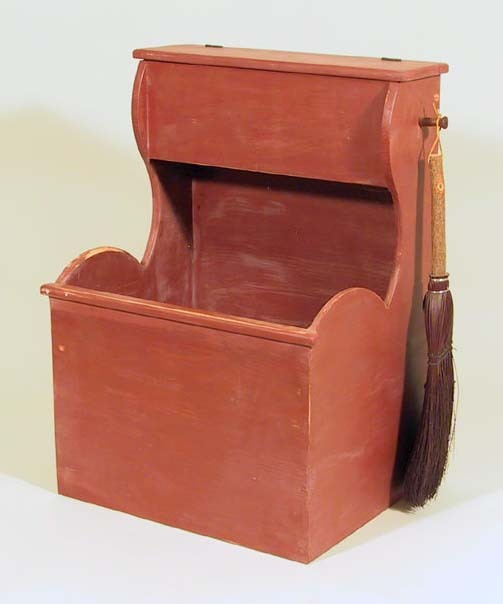 The lid and front lip are made of birch to allow for more wear-and-tear than the pine might withstand and are nailed and glued to the structure. The bottom is of loose shiplap pine with ½-inch lips and is laid up over battens nailed and glued to the bottom of the front, back, and sides leaving plenty of room for the wood to shift. The hanging pegs are black walnut as in the original. Hinges are artificially-aged butts. Finish is barn red milk paint which has been sligthly abraded at the wear points to get rid of some of the new. Overall size in inches: 32 X 23 X 18.